We all know that this little piggy went to market, but did you know that little piggies also sing, and have candy canes, and go jingle-jingle-jingle all the way home? 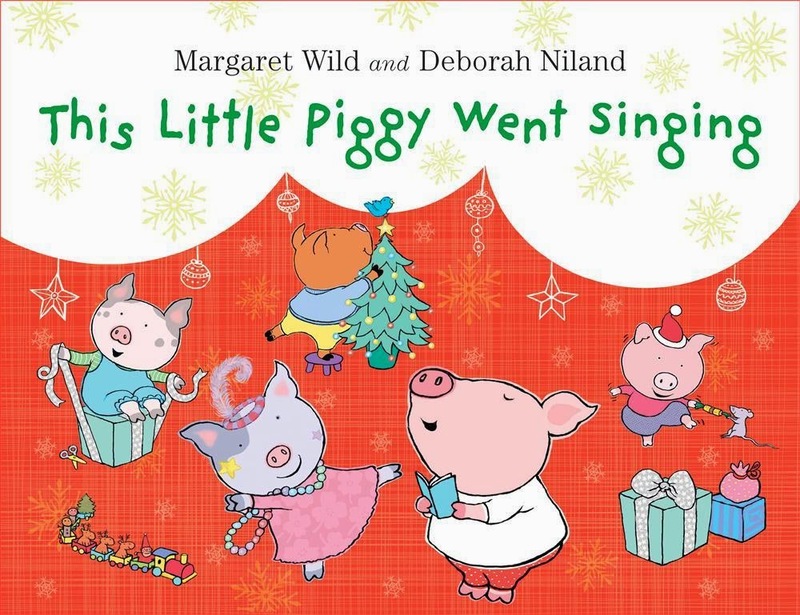 Margaret Wild and Deborah Niland, the duo who created This Little Piggy Went Dancing (KBR review), have given the classic children’s nursery rhyme a Christmas makeover in This Little Piggy Went Singing. The five little piggies are now busy preparing for Christmas by making and posting cards, delivering presents and decorating ready for the holiday season. There are several verses of the nursery rhyme illustrated with Deborah Niland’s cute piggy family undertaking their Christmas preparations. Margaret Wild’s text provides alternatives to the traditional rhyme with each verse offering a musical replacement for the familiar ‘wee-wee-wee all the way home’. Our Christmas piggies happily toot, plink, jingle, tweet, ratta-tat-tat and ho ho ho instead. A sweet story for young children, This Little Piggy Went Singing focuses on preparations rather than Christmas Day itself and is sure to be enjoyed during pre-Christmas story times and perhaps even as a little sing-a-long while decoration or doing Christmas craft at home.